Accurate, standardised payroll processing in 120+ countries through a single SaaS solution. A decentralized global payroll system comprising dozens of providers, models, processes, and data security standards isn’t scalable or sustainable, and racks up hidden costs while compromising payroll efficiency and data quality. CloudPay provides a better way—offering accurate, compliant global payroll in a single, centralized, automated solution that delivers unprecedented transparency and control over your payroll. For many multinational organisations, paying a global workforce means using dozens of local payroll providers, each with their own systems, workflows, processes, and standards. Such a decentralized payroll model isn't scalable or sustainable long-term, and racks up hidden costs. Only by taking a holistic approach to global payroll can organisations assess and optimize the end-to-end efficiency, effectiveness, and economics of the payroll function. That's why CloudPay provides accurate, compliant global payroll in a single, unified, automated solution, with auditable processes adapted to the unique requirements of each location. Now, innovative organisations around the world can experience unprecedented transparency and control of their global payroll, while minimizing complex, error-prone manual processes. Achieve enterprise-wide visibility into processing performance, payroll costs, and compliance measures while driving operational improvements across your entire organisation. Ensure accurate, standardized payroll processing in 120+ countries and 25+ languages, all through a single SaaS solution. Payroll relies on data often housed in enterprise resource planning (ERP) or human capital management (HCM) systems. To transfer that data to Payroll, organisations often rely on time-consuming, spreadsheet-bound processes. By transferring data through manual uploads, organisations increase the likelihood of errors and make sensitive employee information more vulnerable. That's why we've built CloudPay Connect – a framework that standardizes how employee, demographic, and payroll data moves between your software. With CloudPay organisations can seamlessly integrate global payroll with leading HCM & ERP software. We believe that standardized data and automation are essentials to ensuring accurate, auditable, and compliant results. Ensure high-quality payroll processing and reduce costs by synchronizing data in your HCM with CloudPay. Achieve holistic visibility of payroll costs via secure web integration protocols that import data from existing finance and ERP systems. Integrate payroll results and payslips to give employees access to statutory-compliant pay information within your HCM, or use our own self-service interface. Lower IT and development expenses with system integrations designed, built, and maintained by CloudPay’s team of experts. Improve documentation with a Data Dictionary that outlines mapped fields and serves as a guide for future integration. Facilitate the flow of data for processing based on a set of business rules within your HCM application. Automatic data validation before and after processing resolves errors before they cause problems. When incorrect, incomplete, or mismanaged data causes payroll processing issues, managers turn to after-the-fact payroll exception reports in an effort to resolve errors that could have been prevented. The problem is that the errors have already caused delays, undeliverable payments, or worse. CloudPay's data validation framework helps your organization be more proactive by intelligently catching and fixing errors before they lead to re-runs and added costs. This validation framework is customized to adhere to the specific policies and compliance requirements of each payroll in your global footprint, continuing to learn and adapt to your business. Standardised processes, a global payroll calendar, automated workflows, and auditable payroll management increase efficiency and visibility. Completing every payroll run requires dozens of steps taken by dozens of individuals — all at a high volume. Many organizations still take a paper checklist approach to processing payroll at every location, despite a high risk of error from lack of standardisation, different time zones, disparate technology, ad-hoc updates, out-of-sync labour management, and more. Stop managing global payroll schedules with manual and separate local calendars. The CloudPay Unified Global Payroll Calendar streamlines issue management and resolution through real-time collaboration with all constituencies. Ensure consistent, accurate, and timely payroll results, while gaining visibility into upcoming deadlines and workloads to optimize labour management. Simplify service and support with an auditable view into the execution of each pay run around the globe. Track every action to know who performs each step, how long each step takes, and where you can realize new efficiencies — including automating as much of the payroll cycle as possible using standardised, adaptable workflows. Monitor the right metrics with our advanced analytics toolset. Analyse global performance or delve deep into your data for granular intelligence. Sophisticated multinational companies use analytics to power decision-making across almost every area of the enterprise. Global payroll should be no exception. Managing global payroll effectively requires real-time intelligence on what’s happening across the entire payroll function. But when organisations rely solely on exception reports and monthly reviews, critical business questions can go unanswered and opportunities for in-process improvement can be lost. That’s why global companies use CloudPay Analytics for accurate, real-time payroll reports and insights. CloudPay Analytics combines advanced business intelligence technology with standardized data and streamlined integration to deliver complete transparency into payroll. With a dashboard view of the global payroll function, organisations can monitor KPIs, assess trends, benchmark their performance, and drive broad and granular process improvements. 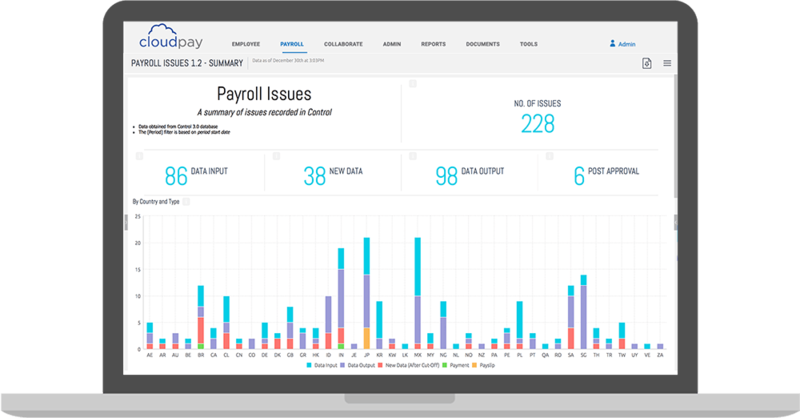 By analysing data within CloudPay Payroll and linking it with data from third-party HCM and ERP systems, CloudPay Analytics delivers a single version of the truth for payroll across the entire enterprise. Increase efficiency: Eliminate the time and effort spent on data collection and management. Drive organisational improvement with a dashboard view of productivity and performance insights. Automate reporting: Create reports automatically to simplify KPI monitoring and benchmarking. Streamline post-process audits and filter the data to address problems at their root cause. Reduce costs: Understand and manage your global payroll expenses in a more holistic way. Uncover hidden costs by breaking down spending across categories and geographies. Improve decision-making: Use accurate payroll data to support enterprise growth or expansion. Elevate Payroll’s strategic importance by delivering personalized, role-relevant data to senior leaders. Take control of your payroll operations to realise a new level of payroll efficiency and focus on your most important objectives.